This is the third in our Finest Tailors series breaking down the styles of the world’s finest tailors. Following on from Richard Anderson and Henry Poole, we now turn to Anderson & Sheppard. Now, Anderson & Sheppard is justly famous as the biggest house that follows the ‘drape’ style of cutting, which uses a touch more material in the chest and back of a jacket, to give the impression of a bigger upper body. However, less noted are the other aspects of the cut: an extended shoulder, a relatively low buttoning point, a suppressed waist and relatively open quarters, all of which contribute just as much to the overall flattering effect as that drape. By comparing the cut of this jacket to the others so far, from Richard and from Henry Poole, you can see what substantial differences in cut there can be even within a very similar tailoring tradition. This jacket, in a sugar-bag blue 110z W Bill linen, was cut for me by John Hitchcock in 2013, before he retired. John made me several jackets and suits, all of which I love. I found I particularly liked the double-breasted style, but I’m showing a single-breasted here to make comparison with the other jackets easier. I also found I preferred the two-button style to a three-roll-two from A&S. The only consistent issue with the pieces from John was that he pushed for slightly longer sleeves, some of which I have had shortened since. This jacket had to be shortened from the cuff, as the linen had faded and would be marked around the sleeve. This means the buttons are now a little closer to the end of the sleeve than normal. As it was a casual jacket, I also decided to have patch pockets rather than flaps. This has worked out well except for the breast pocket, which in retrospect would have looked better as a plain welt. I only have patch breast pockets now on the occasional Neapolitan jacket, where the patch is very small and rounded. Now to the cut. The shoulder width on this jacket is 7 inches, a little more than the Henry Poole and a full inch more than the Richard Anderson tux. The lapel is broad at 3¾ inches, and cut straight with a high gorge (all figures listed at the end of the post). All of these things make the shoulders appear wider. Running down the jacket, the waist is cut quite close and the buttoning point low relative to the jacket length – 20 inches on a 31¼ inch jacket. And then the quarters (below that buttoning point) are noticeably open. This isn’t something we’ve measured, but a comparison to the tuxedo makes it obvious. All those things combine to give this Anderson & Sheppard cut a much more dramatic look, broadening the shoulders and narrowing the waist. In the side profile below, you can also see how closely the jacket is cut into the small of my back, increasing that impression. 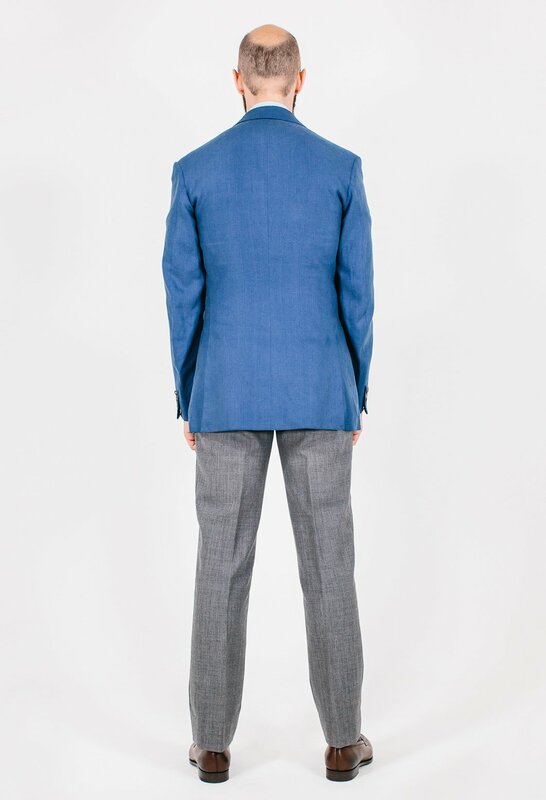 The side view also highlights the line of the sleeve, which is noticeably wider at the top than the other two suits, although narrowing to something around average, at 11½ inches. I’m a big fan these days of a bigger sleeve. It looks stronger and more masculine, as well as making the jacket more comfortable when combined with a small armhole. The only downside is it can look a little messy, particularly in a material that is apt to wrinkle, like linen. 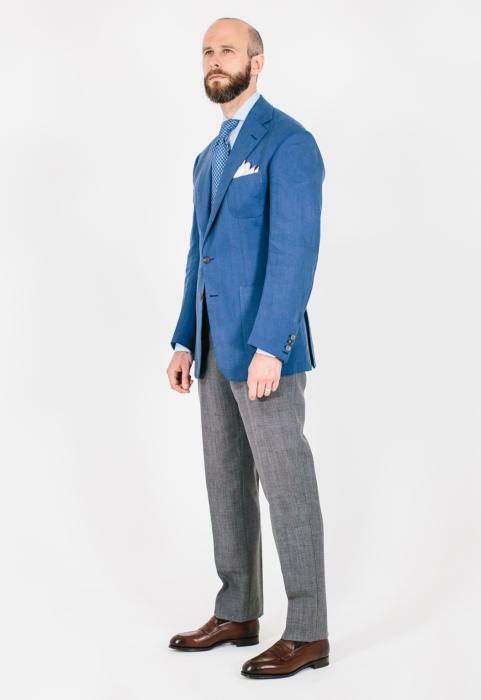 On the subject of comfort, I should highlight that I’ve found A&S suits to be the most comfortable of all the ones I’ve had on Savile Row – a combination of the drape, small armhole, soft shoulder and big sleeve. A&S also uses a slightly backward-leaning shoulder seam, and cuts its chest canvas on the bias (45 degrees) which can help with the movement and stretch. Interestingly, Ciardi in Naples also cuts its canvas in this way. The only downside, apart from being fiddly to do, is that it can be harder to make the bottom half of the jacket sit cleanly. A last technical point is that A&S is one of a few houses that build their own shoulder pads. That applies to the sleevehead too – which here is a piece of wadding folded inside demette (the felt layer used in the chest to sit on top of spiky horsehair). Elsewhere in the cut, this jacket has quite a deep collar (1¾ inches) which suits the length of my neck, but perhaps emphasises sloping shoulders. I’ve always found the attitude to sloping shoulders interesting. Most tailors instinctively want to mitigate them by adding more padding, but if anything I prefer the sloping look. I don’t think higher shoulders are that flattering – they don’t make me look bigger or stronger – and a sloping line makes the overall look more relaxed and less stiff, which is usually a good thing in tailoring. Inside the jacket, the lining is attached to the facing by machine, and the in-breast pockets are cut straight into the lining. This is the same as the Henry Poole suit. Both are ways to save time and money, and generally Poole and A&S are cheaper than the other Row tailors. The only functional difference really is that those internal pockets are not as strong. Overall, I think this jacket is a good illustration of why the A&S cut can be so flattering (and is even more so in a DB jacket). Accessories from the Anderson & Sheppard haberdashery: playing with more colour again, with a bright blue silk alongside the blue of the jacket. The white cotton handkerchief is edged in pink. Shoes from Edward Green (the other sponsor of this series) are Piccadillys in dark-oak antique calf. The trousers are in mid-grey Fresco high-twist wool. You can follow the discussion on Anderson & Sheppard two-button jacket: Style Breakdown by entering your email address in the box below. You will then receive an email every time a new comment is added. These will also contain a link to a page where you can stop the alerts, and remove all of your related data from the site. Interesting technically, yes, but I much, much prefer images taken outside of the studio. Thanks Viktor. Obviously different things we can do with both. In case you didn’t see it, there is this post on the jacket too. I like the neck and shoulders, but can’t work out what’s happening with the sleeves. From all angles the pitch looks off, and the work you have had on the cuffs to shorten doesn’t look well executed at all. Agree about the breast pocket. Trouser looks good; who made these? The pitch might be a tiny bit off, but mostly the wrinkling is about the linen, wearing it rather than showing it freshly pressed (as I usually do) and the large sleeve that A&S like. The trousers are A&S too. Agree about the pitch; too forward. And the back balance is wrong too. I understand that you prefer Crispaire trousers over Fresco. What would be the number of the Crispaire-Bunch when you would want a similaire look like these Trousers? Very interesting and provocative article. Why did John want longer sleeves and how long? Do you have any photos of the sleeves before they were shortened? but you’re literally right because the shirt is under the jacket sleeve. – John Hitchcock’s preference for a jacket sleeve which is as long (not longer than?) the shirt (if that is what you mean) for me also new to hear. I wonder why he is of this view? Surely not because he wishes to prevent soiling of his shirtcuffs? – Who decided and who executed the jacket sleeve shortening from the cuff and not from the shoulder? Thomas Mahon had an annecdote long ago on his blog about this. (As I recall) One day he left the shop at A&S to get lunch but left his jacket in the shop. He was berated by management when he came back because he was wandering the streets in his ‘underwear’. If the jacket were of flannel, my experience of this cloth that it creases and the jacket sleeve becomes too short! I’ve never worn a linen jacket, a cloth I dislike because it creases, but it sounds like there’s no shortening of sleeve length caused by creasing for example around the elbows and you iron the creases out. That’s lovely Simon, thanks for this. Though from the side view, does the balance look a little off (is that just the photo)? Have you had anything made with A&S since John retired (and if so would you be able to comment on relative quality)? Yes, I know what you mean about the balance. I think it’s just the photo though – I didn’t notice this myself when we ran through everything. As ever, photography can be hard to interpret as regards fit. No, I haven’t had anything made there since, but the quality will be very similar. At a large house like A&S, there is usually good consistency because cutters work together, and coatmakers etc are largely in-house so they create consistency too. On the pitch question, it looks as though you are holding your arms quite a long way forward, almost in front of your body. Is this your “natural” hang? If it isn’t then I think the pitch is way off, as pulling your arms back to a more natural position will make quite a mess at the back of the sleeve. Any other colour on pants that You could recommend for this jacket? Excellent outfit and excellent tailoring. I have a similar jacket (similar colour in silk-linen, SB, 3 patch pockets) made by Solito and it is very useful during day-time in the Summer. When it gets destroyed by wear one day, I would reorder it. This is an interesting series Simon, thank you. One request though would be for some DB jackets to be featured. I understand that doing all SB makes like-for-like comparisons easier. However, it would be a shame for none of the DBs in your collection to get this forensic treatment – particularly the A&S which, correct me if I’m wrong, seems to be a particular favourite of yours and many readers. Thanks, and yes that’s a good point. I think on balance I will continue with SBs to make comparisons easier – particularly as I plan for the moment to only take one from each tailor. But perhaps in the long term I can do DBs separately too. There was some coverage of it in this post as well, in case you missed that. Simon, your DB article and these three get enthusiastic reader echo. DB seems aesthetically suited to conceal protruding belly? Although Poole puristically omits two highest only decorative buttons, all those DB otherwise share same positioning, nothing like RTW Chester Barrie DB button closure or Benson & Clegg DB slanted flapped pockets which I favour to straight because dynamic streamlined effect, even organic. Interesting to read your comments on sloping shoulders and you preferring to let that sloping remain unchanged by the jacket. Does that mean you prefer relatively softer construction? Or just that you want the “usual” amount of padding in the shoulders? Yes, I hadn’t quite thought through why the slope doesn’t bother me before. With someone like A&S, I’m happy with the usual padding. But the padding of Huntsman feels a little much. When can we expect something ok W&S? Also, I’ve seen cries for an overview of morning dress. Ever going to happen? W&S won’t be soon I’m afraid – the next batch will compare the Neapolitan makers. And morning dress, yes but perhaps not soon either – probably best with time to make something for the season. i’m glad you’re also adding your personal impressions and some photos with “movement”. while it is nice to see how the suits/jackets look in still (and you still get criticism because they don’t look THAT clean), i thing it is more useful to see how a well made jacket should react to more difficult poses like raising your arms. Looks all right to me. Ignore the naysayers, Mr Crompton. As the great Bernhard Roetzel said, only a glove fits like a glove. Certainly a couple of things I would take a look at, but I agree positively with the comment about mixing action shots with more posed ones. And surely the beauty of this site is being able to make critical observations, as well as complimentary ones, in good spirit? Beautiful jacket..beautiful colour…beautiful material. I agree with your conclusion about the breast pocket. Patch pockets tend to overpower the chest area. The only flaw in my opinion is the sleeve width. Given the close fit of the jacket the wider sleeve looks out of proportion especially in the side and back views. Almost forgot in previous post…great tie….from where? All accessories from A&S Haberdashery…. The shoulders on the jacket make it seem like you’ve adopted a weight lifting regiment. Would you say someone that has broad shoulders/big chest should steer away from this jacket style? If they wanted to minimise the effect of those shoulders, then perhaps yes. Something more Neapolitan might be better. I do say if, as not everyone wants to minimise those kind of points. Adopting a weight lifting regiment would be a good thing with the pressure on the armed forces budget. Having a regime to adopt would, of course, be something quite different!! Actually I don’t think your sloping shoulders (or to continue with the play on words “soldiers” play much of apart here. Beautiful jacket, Simon. The colour is fantastic. I’ve never been a fan of patch pockets, but seeing so many of your jackets on this blog, I’m tempted to go for them on my next jacket – which is likely to be Neapolitan (or a version of it). I agree with your view on the breast pocket. I may have this wrong, but do English patch pockets tend to be larger (and more rectangular) than Italian? Really like the trousers, by the way. They really are spot on. Not sure I understand this. Wouldn’t fading only have been a problem if you were having the sleeves lengthened rather than shortened? I assume the fading you mention is compared to the colour of the sleeve hem. Hi Ian. Yes good point, you’re absolutely right. I was referring to shortening from the shoulder, rather than the cuff, but fading shouldn’t have been an issue then. There must have been another reason we didn’t do that – let me check back and find out what it was. Love the jacket too. What a beautiful blue. Mr Hitchcock was correct on sleeve length. The shortening looks odd and exagerates the slightly too large cuff diameter. The patch pocket is overly-large but that is probably an Italian sensibility vs. an English one. Fully agree with the other comments re. the beauty of the colour, the tie and the overall outfit. Whilst the focus is on the jacket I think the trews could have had more than a single sentence? Interesting on the sleeve, thanks for your views. Yes, the pockets is very much an English style, which rather prioritises practicality. I really like the cut of this. However, I find that linen makes it more difficult to judge the cut and fit of this compared to wool. Linen just doesn’t hold as much shape. I like that you got a patch breast pocket. With open patch hip pockets, I like that the breast pocket matches. With flaps on patch pockets, a welt breast pocket makes more sense. The sleeves are a bit too wide at the elbow for my tastes. The sleeve needs to be wide at the top to drape well, and it should be wide enough at the cuff to be able to fit double cuffs (not that I would wear double cuffs with a linen jacket). But perhaps it’s just the elbows bagging out a bit. Really nice. I rock that color combo too. 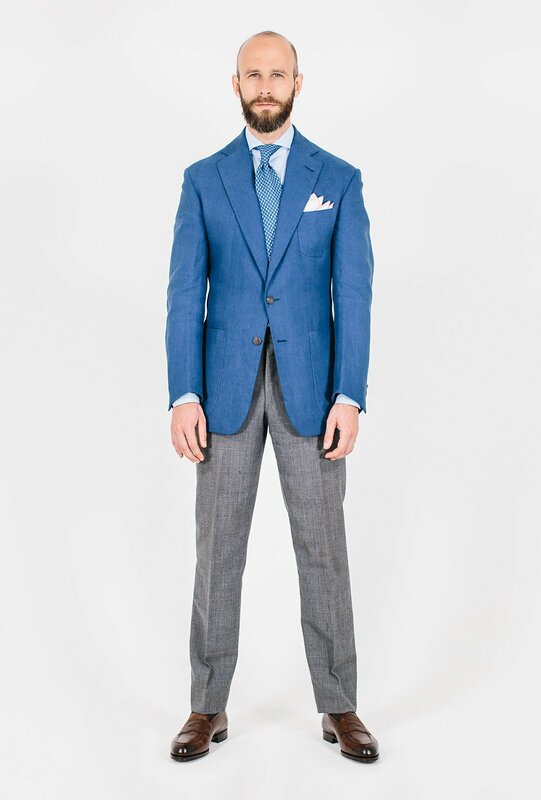 I ended up doing kind of a capsule set out of Fresco (I don’t think I can do linen) with a blue suit, light grey suit, and black/tan and I can use the blue jacket w/ grey or tan pants or black jacket w/ grey. I may have read this suggestion from you. Anyhow, I prefer A&S 3 roll 2 and the cut could’ve been more aggressive at the waist but nit picky and that suit looks awesome. Where would this jacket be worn? It’s color would be difficult to work with on more formal occasions, and the blue of it is a bit grating to my eyes. I do appreciate the workmanship of it though. The coyotes just started howling in the woods not too far outside my window as I type this. Absolutely perfect jacket save one minor point – the breast pocket is best left regular. Overall, this is a great example of why A&S leaves our Italian brethren for dead. You have the softness and beautiful drape with a fabulous cut and they are just so comfortable to wear. Mr Hitchcock did my original pattern before he retired and I’ve had suits made since and the style is the same. As somebody who has a big chest, broad shoulders and large arms I would add that I don’t think this cut adds bulk. I think the reverse is true. It just relaxes your whole look and to good effect. Go too close with these Italian jobs and you risk looking like you should be on the door. Not in the club ! Fabulous – Jason King would approve. I think you’re comparing apples and pears. English tailoring is quite different to Italian tailoring. In any case, A&S have not done a particularly good job on the sleeves. Check the end of the sleeve…..
I’m sorry Mr or Mrs Anonymous, but where did I compare Italian & English tailoring ? I simply said that “this is where A&S leave our Italian brethren for dead”. This is an opinion- some may say a fact – rather than a comparison and I think Simon has already explained the sleeve issue. And yes, I certainly understand the stereotypical difference between Italian and English tailoring but prefer to discuss the real difference between good and bad tailoring. I do prefer my apples to your pears. For goodness’ sake, chaps, they’re both jackets. It’s green and red apples at most. Robert if you think all jackets are born equal, you’ve dialled into the wrong program. This is a work of art that delivers (breast patch pocket excluded) at every level. It is a sartorial masterpiece, not a piece of fruit, and is the illustrates completely the reason why that so many Italians secretly want to emulate A&S. Their history, lack of military heritage and dedication to a house style makes them quite unique. They are also one of the last independents holding out against that dreaded corporate takeover. thank you very much， i have been getting some suits from suitsupply and noticed that they have a relatively high button point(higher than my elbow point), makes the V area looks bit too short on me since i am a tall person. want to avoid that and make sure my custom made ones don’t have that problem. Yes, that’s the fashion these days unfortunately. It’s generally not that flattering, and particularly on a taller man. I think the outfit in full is a great one. That blue is one I think most would avoid seeing it as a swatch but paired with grey trousers, dark brown shoes and, in effect, nothing else too showy works wonderfully. Noting that it is very difficult to judge the fit by the photos, I wondered if you had found that the linen holding its creases around the top of the sleeve head only goes to accentuate the extended shoulder perhaps making the shoulders look too wide? I really like the patch pockets but tend to agree with you about the breast pocket remaining a welt. I happen to like patch pockets on double breasted jackets (not as part of a suit) and again think the welt breast pocket is nicer than a breast patch pocket. Saying that, I personally think the proportions of the breast pocket work with the proportions of the front patch pockets. A side note here that I couldn’t find anything on in other posts. Perhaps I didn’t look hard enough but I never see you wear a double cuff on your shirts. I’ve always found the relationship and proportion between a close fitting barrel shirt cuff and an appropriately sized jacket hem to look somewhat off. The shirt cuff looks a little lost whereas a double cuff fills the space neatly. Can you point me to anything you’ve written on the subject? To be honest I haven’t noticed the wrinkling of the linen emphasising the width of the jacket, no. It’s not something I’ve actively considered, but equally I haven’t noticed a difference between this and other A&S jackets. Totally agree. A jacket hem that attempted to come closer to a barrel cuff would look very odd. I think I’d miss my cufflinks too much which, much like your vintage gold cuff, all come from Greys Antiques Market- a great place to find some treasure! I have a question not directly related to the post in question. My father in law is looking to buy his first bespoke suit in Savile Row, but has little patience to go and try different tailors, and he has asked for my advice. Which tailor should he go to in order to have the best experience possible? Hi Simon, thank you for your answer. Which one would you recommend for a more English, structured style suit? There are so many tailors in Savile Row and I honestly wouldn’t know which one to pick..
I’d suggest Henry Pool or Dege & Skinner probably – have a look at coverage of those two on the site? This is a fantastic new rubric on this blog, thanks! People often say that the first and most vital bespoke piece of tailoring one should get is a navy suit. I was wondering if you could cover this? Particularly if this is a suit which will be worn almost everyday for prolonged periods of time, ie to the office. I feel like an Italian cut can seem a little too relaxed or chic for a professional setting, whereas something more traditional like huntsman a little to structured if the jacket is to be k or on whilst sitting down for 10 hours. Any advice? Thank you! Yes good point. I’d go for a 13oz worsted if you can, 11oz at a minimum. Maybe have a look at the Whitcomb & Shaftesbury that I had made? How do you find A&S compared to the other drape practionners? (I think just Steven Hitchcock and Edwin DeBoise?) Personally I think Steed are making the nicest drape jackets at the moment and prefere theirs to A&S’s- for me Steed cut a more swelled chest and more expressive lapels. A suggestion to develop your blog further on could be to include a short gif-movie together with the photos. I mean with you “walking the suit” for a few seconds. It would tell so much more about the cut of suits and coats. Re. 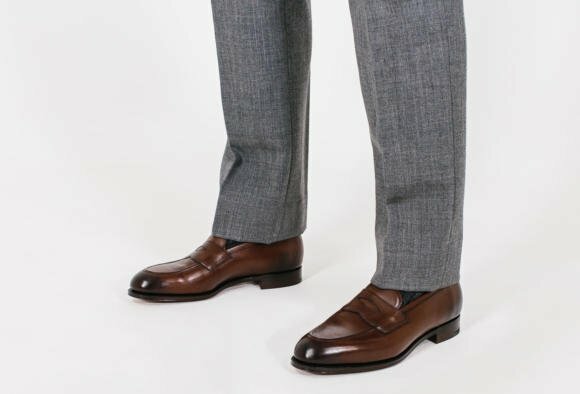 the trews… understand that they don’t vary much but outside of bespoke most dress trousers do not flatter in the way they might. Your own adventures in getting hip/thigh/buttock shape correct are testimony to this. Trousers hang from the waist and are thus less sculptural than their partner but as with many simple things it requires experience to raise it above the mundane. The cut should always be complementary to the jacket as it provides the anchoring for the frame or silhouette of the jacket. You often dismiss trousers when considering outfits (which must be upsetting to the cutters and makers involved in their creation) but experience has taught, especially with separates, that the two must not only be sympathetic but dynamic (in its proper meaning) to work well. I agree entirely. Trousers are too often overlooked, get them wrong and you can really hobble an excellent coat. As a northerner living not that far from the Yorkshire mills that iris produce much of the best cloth I wonder how the ‘value for money’ test applies here. There are some outstanding provincial tailors who produce jackets every bit as finely wrought at half the price (yes I know London costs more thebooetate in – I lived there many years). The blog is fascinating, Simon, but do you ever venture outside Savile Row to try something that might prove just as good at half the price? I’m not being facetious, but I wonder how baby readers of your excellent column would not dream of spending 4.5 grand on something that could be bought bespoke with an excellent cloth and first class workmanship outside the West End. I too am fortunate in having a Hitchcock A&S button two jacket, in charcoal Escorial wool flannel with feint cream window check. The fittings were convivial, as you’ve mentiones before, it’s always wise to allow final decisions to the wisdom and experience of the tailor. The sleeve length is fine , never like flashing a cuff. Mr Hitchcock’s experience and quiet dedication to his craft were exemplary. Thanks again, Simon, for another informative piece. I would have been inclined to live with the original sleeve length – to preserve the purity of the cutter’s vision for the garment. The cuffs look ‘wrong’ to my eyes. This commission doesn’t wow me, which is unusual as I’m a big fan of A&S’s house style. My observation is there’s a tension between the rumpled appearance of linen and the precision of Savile Row tailoring which results in the whole being less than the sum of the parts. I agree with Russ these articles accomplished as they are focus too much on London and Italy. There are many accomplished Tailors North of Watford Gap. On the issue of the sleeves, this type with the wide upper arm do tend to generate a low back pitch but in essence I agree the sleeves are too high and the back scythe is too deep. Nice loafers. North of Watford is not the north of England. Simon, I find that a bit patronising – do you do a reader location survey? As someone who went to the same university as you and who lived many years in and is frequently in London please don’t dismiss us all as Northern oiks. The fact is that nearly 5 grand for a jacket and trousers is beyond much of your readership I suggest, so do them the favour of reviewing a few more tailors who can give them style without paying through the nose for it. I didnt mean it to be patronising, but yes you can tell pretty easily from the Google Analytics. Ok, well try Timothy James Henderson for starters. He used to be based in Yorkshire, is now in Nottingham and has for many years kept a small office in Savile Row (whether he still has it I know not, but he used to find it amusing that his Yorkshire clients wanted his Savile Row label sewn into the jackets and his London clients wanted his Harrogate label when based there. Simon a lot of the tailors from “north of the Warford Gap” regularly attend clients at premises on the Row. Which probably makes them more relevant than ever to your readership because of the amazing value they offer. You should encourage your readers to search them out!! I totally hadn’t recognized the jacket until you linked it below, the color looks so different in studio lighting. I really like the style, except for the lower buttoning stance. No matter how I look at it, it just appears off. Also the in-breast pockets of the Caracenis (both In Milano and in Rome ) are cut straight into the lining. I also have a question: what is the type fabric used for for the lining in A&S’s and Henry Poole’s jackets? Silk? Thank you. What is lining fabric of the A&S jacket made out of? Do Richard Anderson and Henry Poole use the same material? Also known as cupro. I am glad to hear that, since my tailor in Chicago, who is far away from A&S in terms of fame and price, uses it too. It lasts longer and is more breathable than silk. My older suits (30 to 45 year’s old) from A. Caraceni in Milano were initially lined with silk. I don’t know if that or any other famous British or Italian house still does it. Do you know? Now I am older and wiser… and not willing to pay a premium (let’s not forget that nowadays 75% – 80 of the famous Italian tailors’ clientele is foreigner thanks to the internet). Usually, people who enjoy wearing bespoke suits keep the same tailor for life and only change him when he retires. The one that I have now is only my third tailor… and I am 68 years old. Young readers who see the internet pages of the Italian experts using, due to their profession, so many different tailors, shoemakers and shirt makers, may get the wrong impression that this is absolutely normal. Is the change from silk to cupro lining because sweat damages silk more than sweat damages cupro? Partly I’m sure – it’s more robust. It’s also more practical in other ways, as a commenter already pointed out. Great jacket and color and some of the issues are more nits than anything major. Leaving aside the shortening of the sleeves which as someone noted weren’t very well done, this looks great. 4. 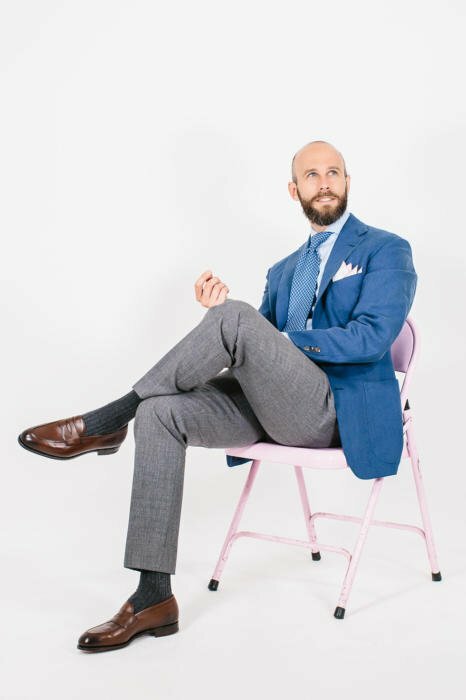 I agree with you that A&S makes bar none one of the most comfortable jackets and slacks – having passed out on transatlantic flights while wearing one of their suits on more than one occasion, I can certainly vouch for that! 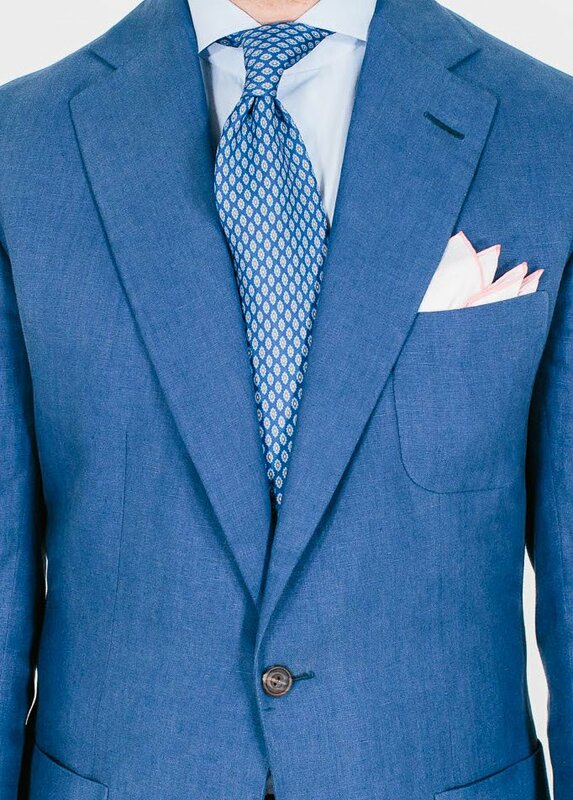 Overall, contrary to popular perception, unless a client starts to dictate things like internal construction, I have found A&S to be accomodative or requests such as lapel widths and button stance much more so than some Italian tailors such as Liverano that tend to be extremely rigid in just about every point in my experience. Again, great jacket and a great series – appreciate reading your thoughtful and informed comments based on your own real experiences. What an interesting and clearly well-informed comment from S J – that’s a lot of experience as an A&S customer! I collected my first linen jacket from A&S about 6 weeks ago. By a rather strange coincidence the two other tailors that I had tried beforehand were H. Poole and Richard Anderson so this series so far almost feels like stalking! I am very happy with my A&S jacket but the one thing I neglected to mention when specifying it was open quarters. I definitely prefer that and really like the way your jacket looks Simon. I will know for next time but am now wondering whether opening up the quarters, which presumably means doing what S J mention in 1 above, is possible and/or advisable on a finished jacket (which is also linen SB by the way) or if this is simply a lesson learned for the next time. VERY INTERESTING ARTICLE.I HAVE A QUENSTION FOR LESS FORMAL DRESSING,I LIKE TO WEAR SILK CRAVAT OR NECKERCHIEF WITH WHAT CLOTHES CAN I COMBINE THEM,FOR EXAMPLE SHIRT PLUS LEATHER JACKET AND CRAVAT OR SHIRT PLUS JACKET A CRAVAT AND POCKET SQUARE. PLEASE GIVE ME YOUR ADVICE THANK YOU. @Simon – please forgive the terminology as I’m unsure of how exactly to phrase this but is the angle of the jacket sleeve’s cuff something particular to A&S jackets or just this one in particular? If one wanted (what I would consider) a more traditional sleeve cuff angle (perpendicular to the cuff) what should I ask for? This is parallel to the shirt cuff, it’s just that the pressing has put a touch of crease in the sleeve and this is kicking it outwards slightly. it will get worse and become frozen. Time for new movement exercise! Peter O, I’m aiming for a ‘Comptomesque’ belly (off for my run shortly) and if I get to that level of flatness will be very happy: so don’t knock it! I suspect given the fortune Simon must have spent over the years on clothes (despite a few concessions no doubt from those featured on his blog) he has to maintain his waistline. My observation about body posture, not body fat. That doesn’t mean I prefer military rigidity to curative eurythmic and other exercises focused on not the belly, but I presume the shoulders to correct what with age hardens and worsens. the movement and carriage gets. Why do you think models learn body carriage? Ask professionals in movement what they think. 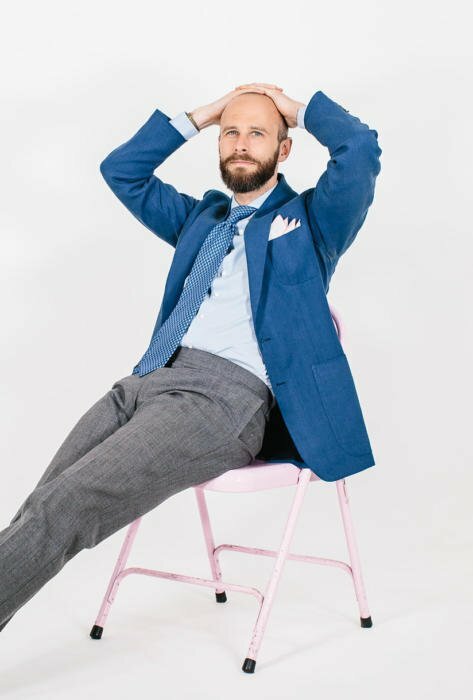 Slightly off topic, do you have any suits or personal experience with Tom Mahon, and how his style compares to the Anderson and Sheppard house style? I know that Tom spent quite a few years at A&S before striking out in his own. I got several MTM suits from English Cut (when it was under Tom’s control—I was one of his first customers and had a nice chat with him when he measured me). And I’m thinking of going with Tom for my first. Bespoke suit. When looking around I couldn’t help noticing his prices are at least 30% cheaper than standard Saville Row, which I largely attribute to the cost of doing business in London. I live in the USA but I know that Tom does periodically travel to NYC and other American cities. I am surprised that with over 100 comments, nobody remarked on the fact that the open quarters show a bit of belt buckle. Is that an artefact of the photographs or is it intentional? How could I forget? Perhaps what I am seeing is part of the waistband of your trousers. Regardless, should it be visible? It depends. It’s a necessary result of more open fronts, which some like and others don’t. As part of this series, is it possible to include a discussion regarding the structure of the jackets? Even a comparison to those that came before or after in the series, in terms of canvas, padding, etc. might be helpful to those readers who do not have access to feel for themselves, or who might be developing a short list of tailors to further investigate. I think that it would be interesting to know how say, the “soft” structure of a Florentine jacket would compare to the English Drape. Beautiful tie and Loafers Simon. You comment on the “small armhole” on this jacket. Are armholes on English structured jackets typically much lower/larger than what is cut by A&S and other drape cut tailors? Hi Simon I noticed that you wrote about a “deep collar” that emphasizes sloping shoulders. Can you elaborate on what this measurement is (what is being measured)? As I have rather square shoulders and have been trying to figure out how to make shoulders on my suits more sloping. Thanks. It’s the height of the jacket collar at the back of the neck – the collar itself measured, from top to bottom. However, where that larger collar has been cut to sit on the suit also makes a difference. It looks like the quarters are a bit too open to wear with a tie (the tip appears to be peaking through). Is that just the pose/photo, or do you think something a bit more closed is preferable for that reason? Beautiful jacket overall. Just one question: Are you sure the pitch of the sleeves is correct? The backs of the cuffs seem a lot lower than the fronts. When this has happened to me, it was a “tell” that the pitch of the sleeve needed to be adjusted. Good point, and yes I know what you mean about the sleeves. It’s obviously hard to tell from photos, but I think it might be a little off. Interesting to see no turn-ups with the trousers here. Would I be wrong to say that normally you prefer turn-ups? Also, I’d do it more on casual trousers than formal ones, and these are fairly formal. Funny that in my youth we considered (perhaps wrongly) that turn ups were for more formal trousers. The exception being black tie. Great article, thank you. I’ve found that many of the comfort aspects you mention ring true for me as well. 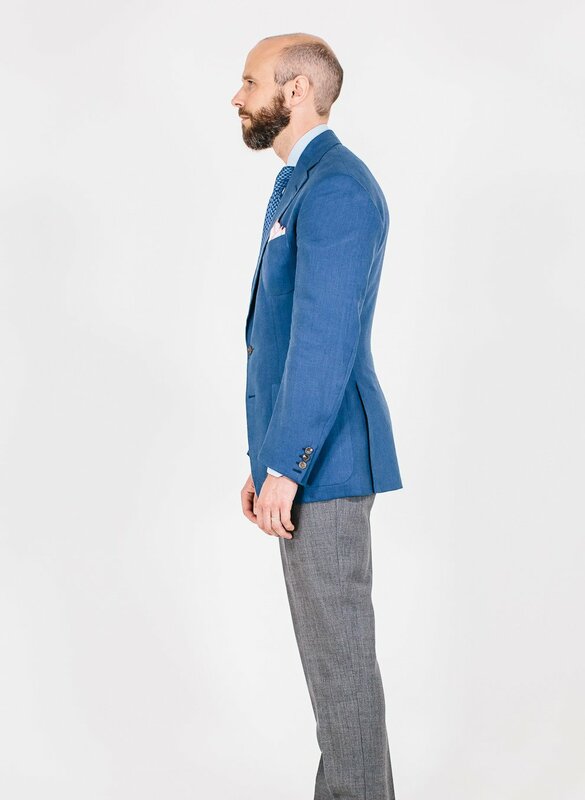 I recently bought a jacket (RTW) from The Armoury in NYC by Ring Jacket and I believe they use a small armhole combined with a big(ish) sleeve. Extremely comfortable! When you talk about the depth of your collar, which measurement is that? Good point Otto, yes they do. I just wanted to ask about A&S cutters? John Malone made me some excellent trousers last year but I was hoping to see a couple of the younger cutters next time round as well. I see that Ollie Trenchard has moved on; is Oliver Spencer still at A&S or has he moved away as well?